The Book • Praise • Look Inside • About Us • ORDER NOW! CHRISTOPHER CERF is an author, composer-lyricist, record and television producer, editor, and cofounder and president of the educational television production company, Sirius Thinking, Ltd. Since its first season in 1970, Cerf has played a pivotal role in the creation and production of the “Sesame Street” television program, most notably as a regular contributor of music and lyrics. In the process, he has won two Grammy Awards and eight Emmy Awards for songwriting and music production. Currently, Cerf serves as Co-Executive Producer of “Between the Lions,” the multiple-Emmy-award-winning children’s literacy series, created by his company for PBS. For more information see: Wikipedia. PAIGE PETERSON is a noted New York artist who has also appeared on “Oprah” and Lifetime Television’s “Our Home,” and who has designed and styled segments for ABC’s “Good Morning America.” Her paintings are exhibited regularly in galleries across the country, and in 2003 she was selected for membership in the prestigious Guild Hall Academy of the Arts. While growing up in Belvedere-Tiburon, California, Paige walked down the old railroad tracks to Blackie’s pasture and fed him apples, carrots, and sugar cubes until Blackie’s death in 1966. She lives and works in New York City. For more information, see: Wikipedia. WELCOME BOOKS was established in 1980 by cartoonist Tom Wilson and Lena Tabori, who is also one of the co-founders of the illustrated publisher Stewart, Tabori & Chang. Conceived as a licensing agency, Welcome quickly evolved into a vehicle for Lena to create and develop visual book projects for other publishers. Among the first projects Welcome produced is its most successful title to date: Grandmother Remembers. Published twenty years ago in 1983, Grandmothers has sold close to two million copies and remains a perennial seller to this day. 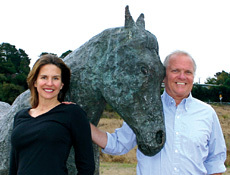 TIBURON PENINSULA FOUNDATION began in 1969 when a generous man named Sam Shapero, who was the Town of Tiburon's treasurer, decided that Blackie's Pasture and the area around it needed to be preserved and protected. He did two things: he went out and bought one-third of the land, then gave it to a foundation he created, the Tiburon Peninsula Foundation. The Foundation then raised the money needed to buy another third of the land, gifting its two-thirds to the Town of Tiburon on the condition that they wrestle the remaining third from Caltrans. Tiburon managed to do just that and, from this start, came an organization dedicated to promoting, facilitating, and enhancing the quality of life and sense of community on the Tiburon Peninsula. ©2006-2019 Welcome Books. All Rights Reserved.